When piping cake decorations, it’s important to get the consistency of the icing right. It should hold its form in the bowl. Too thick and the icing will break, too thin and it will not keep its shape. To create simple pearls, use a small plain nozzle. Hold the bag upright, nearly touching the top of the cake. Squeeze gently from the top of the bag. Stop squeezing before you move the piping bag away. The same technique can be used with a star-shaped nozzle to create stars. Edging on cakes can be created by holding the piping bag fitted with a star nozzle at an angle to the cake. Squeeze out a generous star of icing. 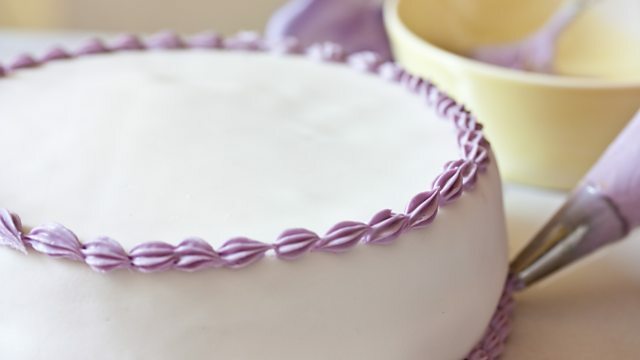 As you lower the tip, stop squeezing and pull toward you to create a pointed “tail” of icing. Repeat until the edge of the cake is completely covered. For a fancier border, squeeze from the top of the bag to create a small clockwise spiral. Release the pressure at the bottom of the spiral. Overlapping this “shell”, pipe another spiral anti-clockwise. Continue, overlapping the shells. Always pipe onto firmly set icing so that you can scrape off any errors easily. If you are writing text onto your cake, use a toothpick to mark out the letters as a guide before you pipe. You may find that you need runnier icing for fluid lines and letters.